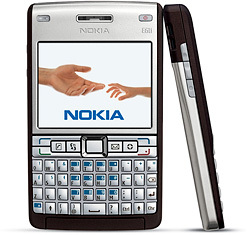 The Nokia E61i From An E61 User's Perspective | OhGizmo! Who Needs Girls When You Have Mousepads? By Andrew Liszewski on 02/13/07 • Leave a comment! Today at the 3GSM World Congress Nokia unloaded a whole pile of new cellphones upon the geeky masses and a few of them were from the company’s ‘E’ series including the new E61i. As a mostly satisfied user of the E61 I was curious to see what issues Nokia had addressed with the ‘i’ version of this phone. I think most users of the E61 will agree that the biggest change comes with the ‘joystick’ of the E61 being replaced with a flat 5-way navi key on the E61i. While I don’t hate the joystick on the current model it seems to have the feeling that it could break off at any moment even though I’ve found it to be quite durable. In addition it’s not always the easiest thing to click down on when you want to make a selection. It definitely works as is but I like the change Nokia has made here. And besides a few extra buttons, a slightly updated keyboard, a bit of slimming and a stainless steel finish the E61i also adds a 2 MP camera which the E61 didn’t have at all. I know the lack of camera was a big issue for some people but it was not something I’ve ever missed. I’ve had plenty of cameraphones in the past and rarely used them to take pictures. However it’s nice to see the idea that a business-oriented phone can’t have a camera going the way of the Dodo. Overall the phone is a definite an improvement but I’m disappointed that Nokia didn’t add a scroll wheel to the E61i. It was something I was really hoping for and would have made a great phone even better. So overall I think the fact that Nokia simply changed the name by adding an ‘i’ is a clear sign that they don’t believe this phone is that much of a leap from the current model either. I’m usually quite eager to upgrade my gear when the next version comes out but with the iPhone somewhere on the distant horizon and rumors that the Blackberry 8800 could include a wifi equipped version I don’t think I’ll be running out for this upgrade any time soon.